Before you set off to build the deck of your dreams, start by finding the material best suited to your aesthetics and budget. Q: I’m putting a new deck on my house and I want to make sure it is constructed properly. What is the best decking material? Should I use natural wood, pressure-treated, or something altogether different? A: With so many deck options available today, from natural wood to composite and aluminum, the decision may seem overwhelming. Ultimately, finding one that suits your space comes down to a compromise of four key factors: budget, climate, ease of maintenance, and overall aesthetic. 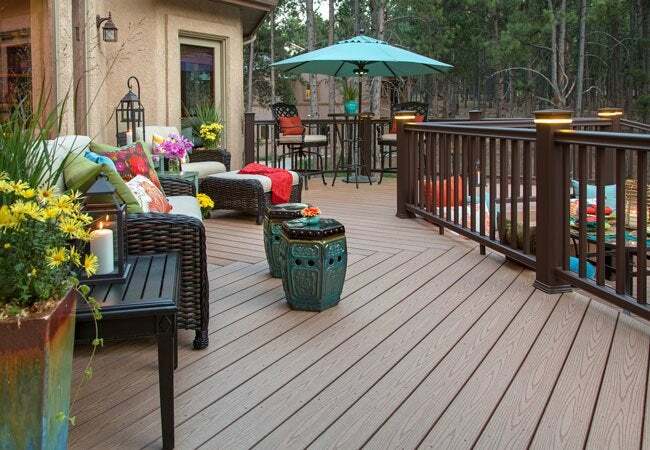 Start your construction process by considering these five most popular picks for the best decking material—we’ve got the pros and cons for each. Natural wood ($3.75 to $20+ per square foot) is durable and beautiful, but costs can run high. 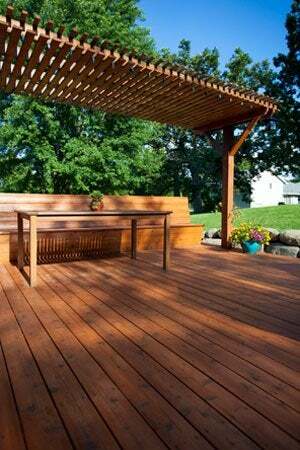 Many homeowners opt for natural wood decking, whether it’s cedar, redwood, or tropical hardwoods. These durable materials, which have a traditionally beautiful appearance and rich color, resist rot and insects. But such attractive qualities come at a cost—both financial and physical. If you opt for natural wood decking materials, the price will depend on your desired variety: Expect to pay about $3.75 per square foot for cedar and $8 per square foot for redwood (although the latter will typically be cheaper on the west coast, where it’s more readily available). Some exotic hardwoods cost more than $20 per square foot! And without proper maintenance, it tends to fade or crack, so keep your investment in tip-top shape by pressure washing and re-sealing every couple of years. Pressure-treated lumber ($1.50 to $2.50 per square foot) is a popular and affordable wooden alternative. Often made from a southern pine infused with a chemical to make it resistant to rot, moisture, and insects, this widely available decking material is generally the least expensive option and therefore the most widely used. Homeowners enjoy pressure-treated wood for its durability and visual similarity to natural wood. It’s an ideal option for do-it-yourself construction because, unlike natural wood, it’s easy to cut and fasten with nails or screws. (If installing a pressure-treated wood deck, just try to avoid the cheapest budget varieties, since these are typically more susceptible to cracks, warps, and splits over time, any of which could actually cost you more in repairs down the road.) The biggest downside to pressure-treated wood? The infused chemicals release toxic gas into the air if burned, so it’s important to always reapply a good sealer when you stain every few years in order to minimize the exposure to chemicals when using the deck. Otherwise, in regards to maintenance, homeowners will need to pressure wash annually. Plastic decking ($7 to 10 per square foot) stands up well over time, but the synthetic surface doesn’t look as natural. The most popular plastic decking material is polyvinyl chloride (PVC), although there are also versions made from polyethylene. Just like composite decking, plastic is durable and easy to maintain, requiring regular cleaning with just a garden hose or bucket and mop. Plastic will not warp, crack, or split over time, and it’s impervious to moisture, rot, decay, and insects. What’s more, the surface does not need to be sanded, stained, or sealed. That said, plastic decking does have its disadvantages. The surface gets extremely hot in direct sunlight and susceptible to mold and mildew in shade. And, while available in a wide variety of colors and styles, darker colors tend to fade over time and lighter colors sometimes develop a chalky coating. And, if you can live with its industrial appearance, aluminum decking ($7 to $10+ per square foot) boasts many advantages. Often used near swimming pools and lakes, aluminum decking is a long-lasting and low-maintenance material. Most options feature a baked-on, powder-coated, or anodized finish that stands up to harsh weather conditions. Aluminum is extremely resistant to mold, mildew, and staining, and it also won’t rust, rot, crack, or peel over time. What’s more, most aluminum decking comes with a non-skid textured surface that prevents slips and falls. Surprisingly, most varieties of aluminum decking manage to stay cool even on the hottest days. However, this combination of benefits makes it one of the most expensive options, second only to some varieties of natural wood. The price—as well as the distinct industrial appearance—isn’t for every homeowner.